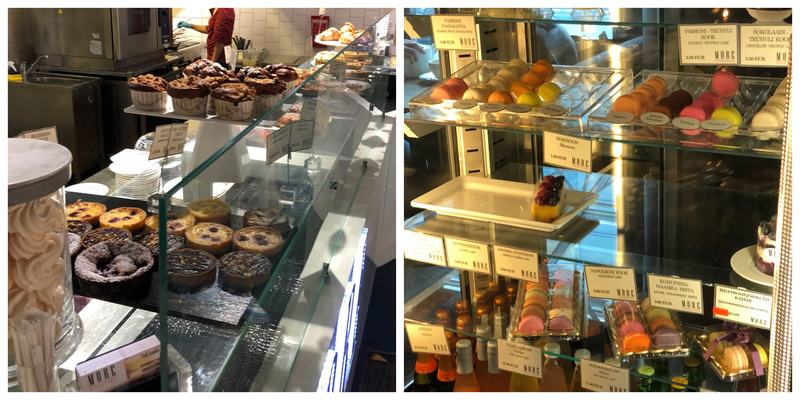 Review: There are apperent not one but TWO cafes inside of the book store on top of the Viru Keskus which is not a thing any of us were prepared for and thus all three of us got lost on the way to this cafe. Easily accessible Cafe More is located in Viru Keskus and just steps from Old Town instead Rahva Raamat, the largest bookstore in Estonia. While you can stop at Cafe Gustav on the floor below, you’ll be rewarded if you walk up an extra flight of the stairs with more! (I’m sorry I’ll stop making terrible jokes forever now). 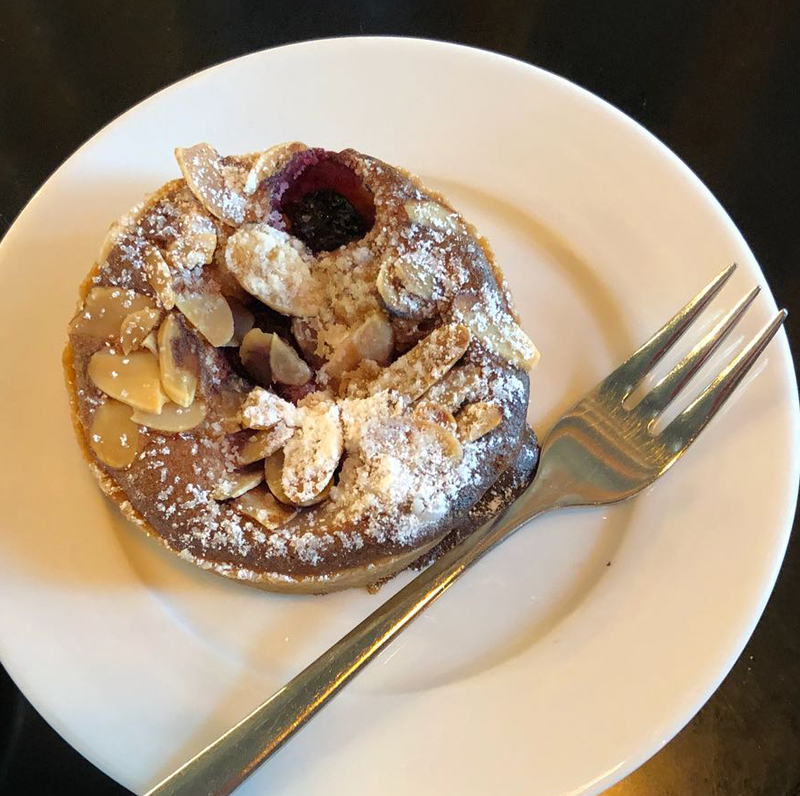 Compared to Gustav, More has a laid back attitude and includes much more food and drink options though the cakes and sweets seem to be much more ordinary. The service here was really good and Greta thought the guy who took our order was extra attractive. Orders are placed at the counter and then brought to the table making the whole process fairly painless. There is plenty of seating inside though most of the tables were a little bit on the smaller side so if you’re ordering a few items you might run out of space. The pricing is slightly lower than most places though most of the food and sweet options are also much more simple so the scale of economy is about the same. Greta got the Rowanberry Cake which is about halfway between a muffin, a popover, and a cake. Despite being kind of a mystery about how to eat it (it came with a fork but then it defied logic by not really breaking in to pieces when stabbed) this was a really nifty little dessert. 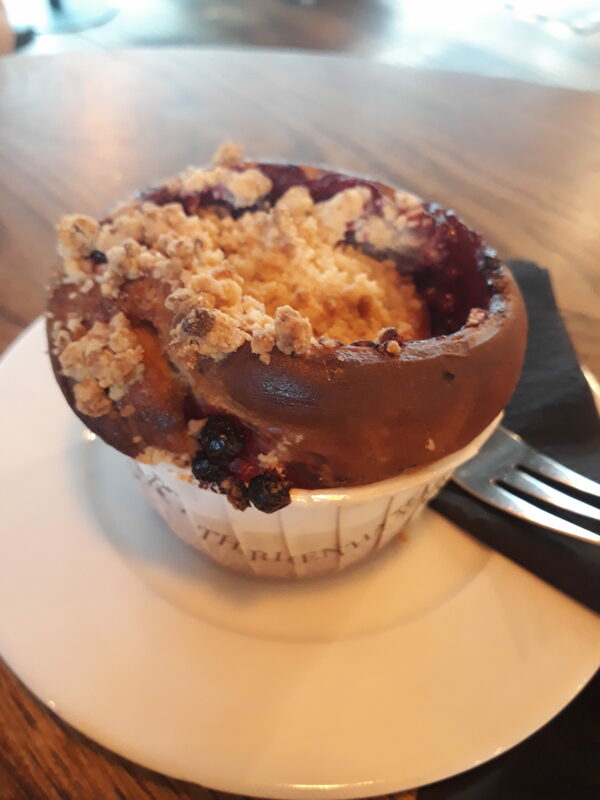 The size is just perfect and its got crumble and fruits in it so a little bit sweet and chewy but also a little extra texture. They had quite a few of these cupcake-style cakes with different berries and I bet they’re all pretty good. I’m not going to lie to you, I wasn’t having the best day of my life and I kind of forgot what was in this tart. I think it was apple, blackberries, and almonds. Something like that. It was good though. The downside is that I felt like this was something I could have made at about this level so I’m not sure I would want to pay for it unless I was really having a terrible day. I ate this bad boy, the Schwarzwaldi Cake. Not only was this the most expensive cake they had, it was easily the largest as well. 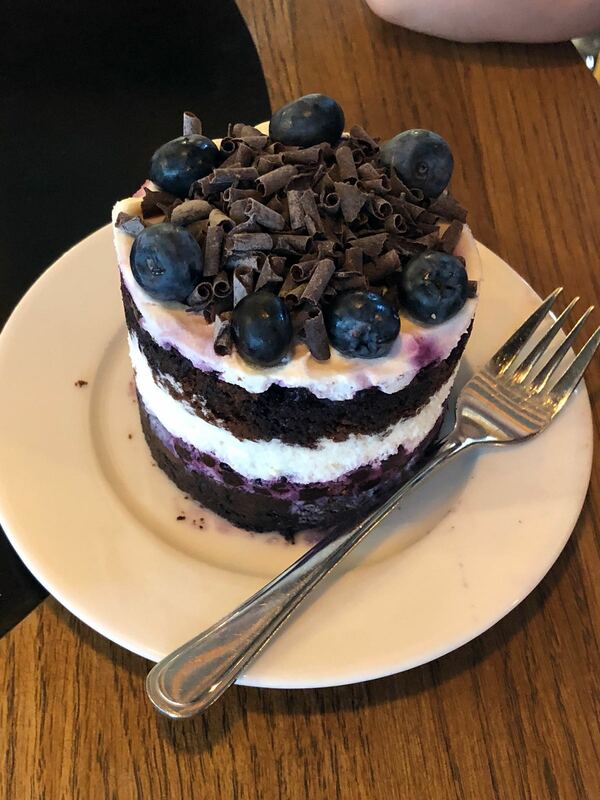 With two thick layers of chocolate cake, two layers of blueberries mixed with cream, AND two layers of regular cream topped with chocolate curls and blueberries it was too much for one single soul to handle. 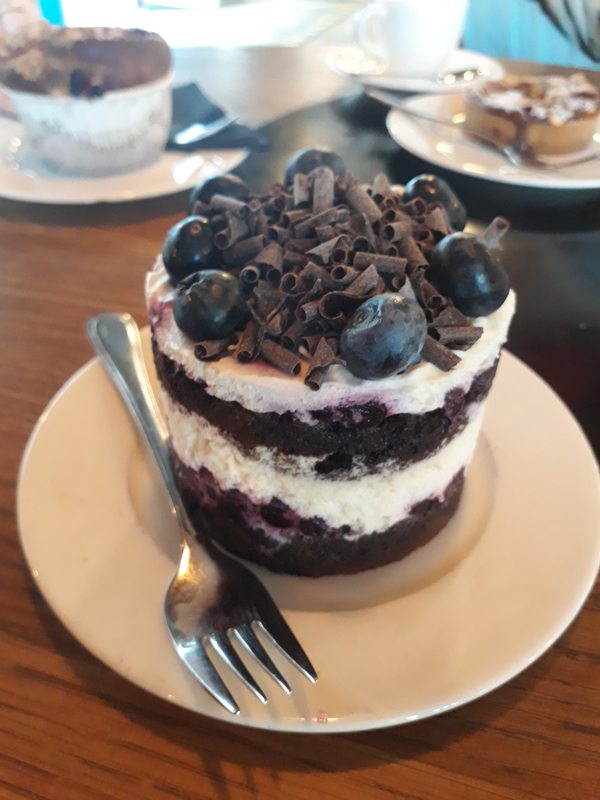 This cake resembles a black forest cake but with blueberries (which are my favorite fruit). While it looks rich and sweet, actually it was quite light and just sweet enough to be classified as a dessert. If it had been any richer I wouldn’t have even made it through half the cake but I managed a very dignified 3/4 of the piece. The coffee at this place was perfectly serviceable. Overall I think this place has a really solid set of diverse offerings at a good price point and you could do much worse. I probably wouldn’t go out of my way to go here but if I wasn’t feeling adventurous and I just wanted something simple and comforting, I’d choose this over Gustav.